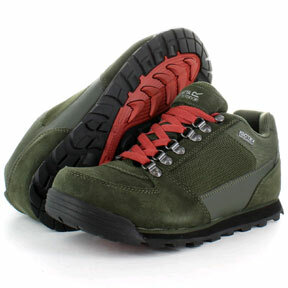 Regatta walking shoes from Outdoor Look. Buy discounted walking trainers and Regatta hiking shoes online today. Cheap Regatta walking shoes available for next day delivery. Regatta Walking Shoes come in a variety of shapes, and sizes, but always of the latest quality materials that make these items essential for the workwear environment. The Regatta Fastrack XLT Footwear uses the latest Isotex materials and advancements to produce a piece of footwear that not only looks good but is both waterproof and breathable. This shoe is suitable not only for use as workwear but as leisure shoes as well. The Regatta Ladies Guideway Walking Shoe has a PU nubuck and breathable mesh upper. The use of Isotex technology makes this shoe waterproof and breathable – it’s been seam sealed and has a breathable internal liner. Its lightweight rubber outsole features internal EVA shock pads and a steel shank, so is ideal for workwear or outdoor walking. Regatta Walking Shoes are available in our free catalogue and on the website, so with our free delivery options backed up by our excellent customer service pick up a pair today.